On Tuesdays there is a farmers’ market in the Marktplatz, so after another leisurely breakfast we strolled along to check out the stalls. All the produce looked very fresh and delicious, but photo ops were relatively sparse. One plus point was that the buildings around the square were beautifully lit by the morning sun. We walked along Grimmaische Strasse, stopping to take a few photos as we went. Some of our subjects duplicated yesterday’s efforts, as today the sun was out and everything looked brighter and better defined. We managed, for instance, to get much better photos of the monument we had previously taken as being to the 1989 Monday Demonstrations. We were wrong! This is known as Die Unzeitgemäßen Zeitgenossen, the Untimely (or Outmoded) Contemporaries, and dates from just before that period, having been created by Bernd Göbel in the period from 1986 to 1989. The figures depicted are a pedagogue, a diagnostician, a rationalist, a city sculptor, and an art theorist. Some comments online do suggest though that this is a commentary on the GDR period, including one which said that Göbel gave the sculpture to Leipzig in 1990 as a gift to symbolize ‘the people that have plagued your city’. On the other hand, another description I found read that ‘the Socialist sculpture represents five of the working class of East Germany at the time’. I guess it’s all in the eye of the beholder! We had decided that this better weather made the Observation Platform of the City-Hochhaus an attractive proposition. This is a 36-storey building, the tallest in Leipzig (by some way, I would imagine), and was built between 1968 and 1972. The architect, Hermann Henselmann, intended it to look like an open book but I confess that was lost on me when I saw it – and on locals too, it seems, as their nickname for it is Weisheitszahn, wisdom tooth! It used to belong to the university but is now owned by Merrill Lynch, its offices rented out to private companies. We took the lift to the 29th floor, paid the required 3€ and climbed some steps to the outside viewing platform. This is quite small but offers almost 360 degree views over the city and beyond. Signs on the parapets helped us to pick out many landmarks - the zoo, the Hauptbahnhof (Central Station), Nicholaikirche and Thomaskirche, new and old town halls, the Völkerschlachtdenkmal, football stadium (Red Bull Arena) and more. There is a small café up here but that was closed, although we could use its seating to take a break while admiring the view. Back at ground level we headed for the tram stops in the centre of Augustplatz. Checking the maps by the stops and information on the ticket machines we were able to plan a route to Eisenbahnstrasse. Chris had read in the Lufthansa magazine, on our way here, that this was an interesting up-and-coming area and we were keen to see something of Leipzig beyond the old town. So we took the tram (number 4] and then a bus to Herman Liebmann - Eisenbahnstrasse where we started to look around. Check out that slogan! Do you think the company puzzle over why so few English speakers are tempted to take their tours? But the ice cream parlour recommended in the article, Molekühl, had closed down, and the streets were lined with the sort of businesses you see all over London, so not really any sort of novelty for us - a kebab shop, a couple of food shops, a couple more selling cheap clothes. There was relatively little street art too, compared with what I had expected, although we unearthed a few photogenic spots. We decided not to hang around to explore further afield, and instead got a tram to the Hauptbahnhof where we changed to the S-barn bound for Plagwitz. It was a pleasant ride past lots of summer cottages with their allotment-style gardens and old industrial buildings - some crumbling, others restored and re-purposed. Once we alighted at Plagwitz it was a short walk to our well-signposted destination, the Baumvollspinerei. As we arrived at the complex we spotted a shady Biergarten to one side - a welcome sight, as it was by now quite some time since breakfast. It was also a hot day, and sightseeing is thirsty work, so I was happy to see home-made ginger lemonade on the menu, which proved to be as delicious and refreshing as I hoped it would be. After our break we went into the mill complex. It was interesting to wander round the old buildings which, despite (or perhaps because of) their occupation by artists, still had an air of disuse and decay which was rather photogenic. I was struck by the number of old clocks - presumably as a mill time-keeping had been important. Less so nowadays however - each was showing a different time! Disappointingly however, none of the galleries was open to visitors - a couple were rehanging, others only open in the second half of the week (Wednesday or Thursday through to Sunday). And the people we saw here, some of whom at least I assumed were artists or craftspeople, seemed to be spending their time sitting around chatting to each other rather than creating art and welcoming visitors to their studios, as we had expected. So after an hour or so taking photos we headed back to the city centre, this time by tram (number 14). By now we were hungry (it was mid afternoon) so we stopped off at the Milchbar Pinguin, almost opposite our hotel, where I had an ice cream sundae with caramel sauce and Chris a coffee with Apfelstrudel. Both hit the spot! We wandered around some back streets and skirted the market (which was still going on, although some stall holders were packing up) and headed back to the hotel to relax a while. I had read good reviews of this restaurant next to the Thomaskirche so we decided to give it a try. On the way there we stopped off at the Coffe Baum for a beer and enjoyed people-watching and listening to the sound of the fountain. It was a mild evening so like everyone else at the restaurant we decided to sit outside. 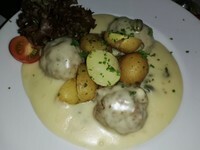 I loved my salmon starter, as did Chris his carpaccio, but while he also really enjoyed his Wiener Schnitzel, my Klopse (meatballs) in a caper sauce were disappointing - the meatballs themselves far too salty and the white sauce rather heavy and thin on the promised capers. Still, the potatoes were very good and the Schwarzbier I drank also good. After dinner we strolled back past the church, taking a few photos as we went, and across Markt back to the hotel. Loved following you through the city. The steeple on Thomaskirche reminds me of Angels Gate Lighthouse in San Pedro (LA). The light makes a tremendous difference doesn't it? And it is something that's really not under our control, at least outdoors. I was completely unable to discern which outmoded comtemporary was which. You certainly made the most of your time here, Sarah. Any tall building with a lift and outdoor viewing platform is an absolute must isn't it? Thanks all Rosalie, I wondered if the one with the listening horn might be the diagnostician, but I'm not sure. Thanks for your visit Lesley - we do always try to get the most out of a few days anywhere! And Malcolm, yes, it just has to be done, doesn't it? !